Fix it, don't buy new! You would be surprised at what can be repaired with a good weld and be like new again. In these hard economic times, repair work fits into the budget. 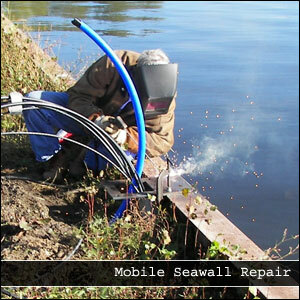 The demand for repair work exceeds 80% of our actual welding services we provide to our customers. All welding processes are available and several materials are serviceable. Call Robin Jaranson, Certified Welder, at (847) 363-5856 for a free estimate on your repair work. Everything from simple to complex is handled with state of the art equipment, and is backed by years of formal education and hands on experience. Your repair is just a phone call away! In addition to welding repairs, we also provide repair diagnosis which involves evaluating the weakness of a piece or design and fabricating a preventative solution. Field service available in the northern Illinois and southern Wisconsin area. Please call (847) 363-5856 for separate field rates.